The BEK Basic Electric Kit is a versatile alternative to circuit board projects. User-friendly components make this kit ideal for individual student investigations. Instead of using a circuit board, separate components are mounted onto plastic panels with 4 mm sockets. Students then connect the panels to 4 mm stackable leads, which changes the panels into simple circuits. Students gain a better understanding of how electricity moves through a circuit by making circuits themselves. Ordering information: Kit components include switches, rheostats, bulb holders, bulbs, leads, clips, diodes, resistors, wire, foil, steel wool, and a teacher's guide. 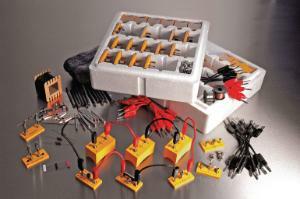 All kit components are packaged in durable polystyrene storage trays.